Until NASA starts sending manned expeditions to heavenly bodies other than the moon, it’s extremely difficult for anyone to occupy a spot where no human being has ever previously stood. One such location, until quite recently, was the summit of a feature known as the Shark’s Fin on Meru Peak in the Himalayas (elevation: 21,850 feet). Shaped remarkably like its namesake, it’s considered one of the world’s most difficult and treacherous climbs; every attempt to scale it had failed, including a 2008 expedition in which the three mountaineers—Conrad Anker, Jimmy Chin, and Renan Ozturk—were forced to turn back just 100 meters short of their goal. 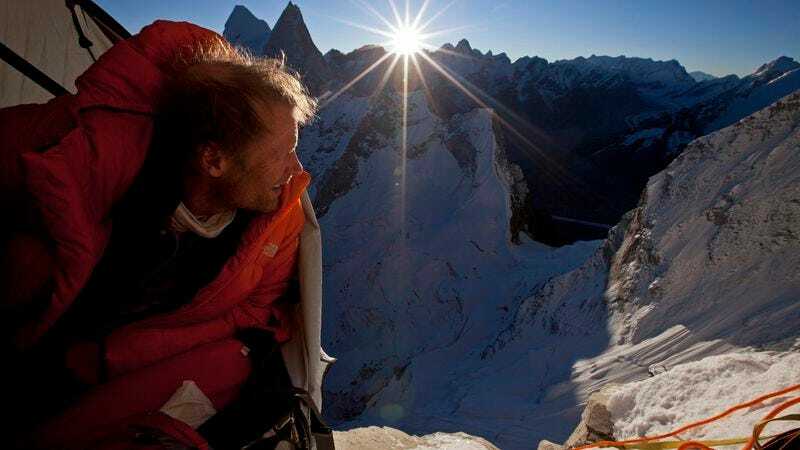 Three years later, however, the deed was finally accomplished, and the extreme-sports documentary Meru chronicles the feat in detail, with footage shot by the climbers themselves. And who succeeded where Anker, Chin, and Ozturk had failed? Anker, Chin, and Ozturk. How one responds to Meru will largely depend on whether its three subjects come across as heroically courageous or suicidally reckless. The film’s initial half-hour documents the failed 2008 attempt, for which the trio brought a week’s worth of food, then spent four days trapped in their tent (hanging from the side of the freakin’ mountain) during a massive snowstorm. That they chose to press on with depleted rations doesn’t necessarily instill confidence in their collective judgment. (Ozturk, who was a relative amateur, readily admits that he’d expected to head down and was stunned when Anker and Chin started climbing instead.) Then it’s revealed that (a) Anker’s wife, Jenny, was formerly married to his climbing partner, who was killed in an avalanche; (b) Chin was nearly killed in an avalanche a few months before the second expedition; and (c) Ozturk suffered a massive skull fracture just four days before Chin’s near-death experience, and was in such bad shape that doctors initially didn’t think he’d ever walk again. At this point, some viewers will conclude that “because it is there” doesn’t justify repeatedly putting oneself in potentially mortal danger. (As a bonus reminder of the possible outcome, Anker is the guy who found George Mallory’s remains on Mount Everest in 1999.) In particular, letting Ozturk come along a mere five months after he suffered an injury that cut off the blood flow to half of his brain seems insane, and what happens during the second expedition only confirms how foolhardy that decision was. All the same, it’s hard not to admire such perseverance and fortitude, and Meru offers some predictably stunning high-altitude imagery, with the potential to provoke fits of vertigo when projected on a huge screen. Oddly, the film doesn’t mention until the end credits, that Chin is one of the directors, alongside his wife, Elizabeth Chai Vasarhelyi. Without that knowledge, it can be distracting to wonder how the hell a camera crew got directly above Anker on the mountain’s almost vertical face. Only for a moment, though. 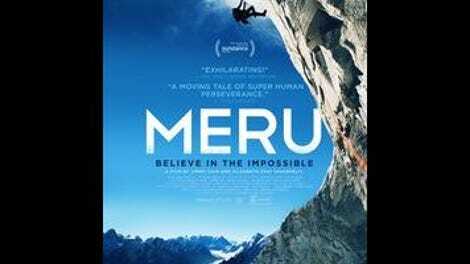 Ultimately, Meru is a doc that aims to inspire pure awe, and if it achieves nothing more, that’s not so bad.